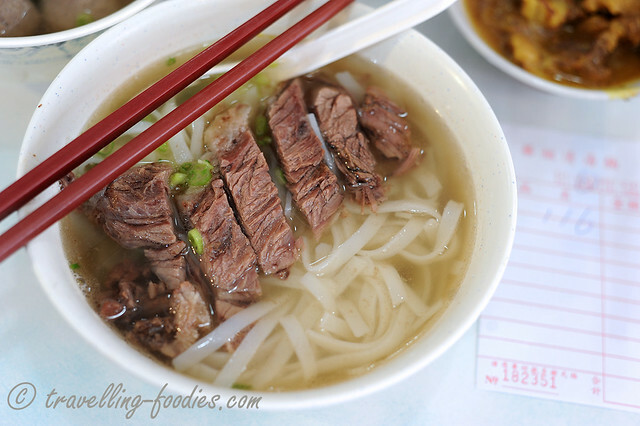 For folks who are familiar with beef noodles in Hong Kong, 華姐 and 九記 should immediately come to mind. 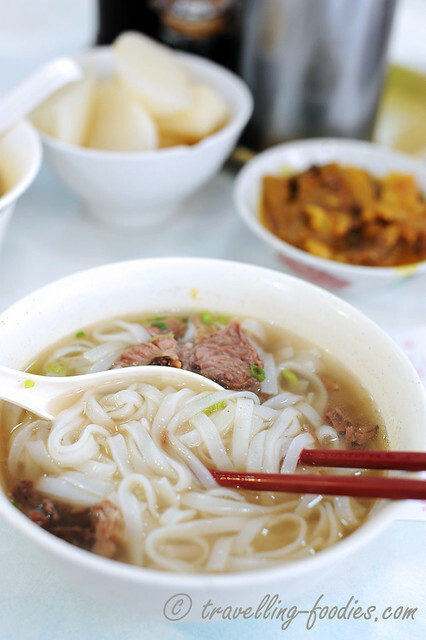 Unlike their Taiwanese counterparts whose recipes originated from largely Szechuan and Zhejiang cuisine to become what is uniquely “Taiwanese Beef Noodles” as we know today, Beef Brisket Noodles in Hong Kong can be traced back to its ancestry in traditional Cantonese cuisine. Flavours wise, the two varieties couldn’t be more different. While Taiwanese Beef Noodles swear to be rich and robust in flavours through the liberal use of spices and condiments, the Cantonese rendition opts to occupy the other end of the spectrum where simplicity and clarity are the key notes highly played. But as most foodies would know, the simpler the dish may seem, the harder it is to get it right but I think 華姐清湯腩 Sister Wah Beef Brisket definitely nailed it. 華姐清湯腩 Sister Wah is located in 天后 Tin Hau which is a residential estate located in the North Point district just after Causeway Bay. 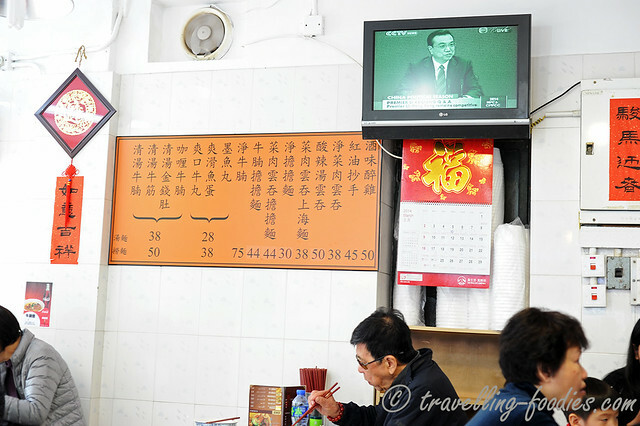 The shop is situated within eye’s view from one of the MTR exits and thus not difficult to find at all. The menu on the wall in Mandarin with some items which we didn’t expect to find. They have 红油抄手 Wanton Dumplings in Chili Oil which is distinctively Szechuan and yet at the same time, 酒味醉鸡 Drunken Chicken which is classically Shanghainese. Their dumplings are also not wrapped with shrimp as what the traditional Cantonese would do, but instead opts for a 菜肉 meat and vegetable filling which reminds of Shanghainese dumplings. So we were kinda confused to what cuisine they actually serve but actually it doesn’t really matter as long as they serve good food! Our order of 3 dishes, i.e. 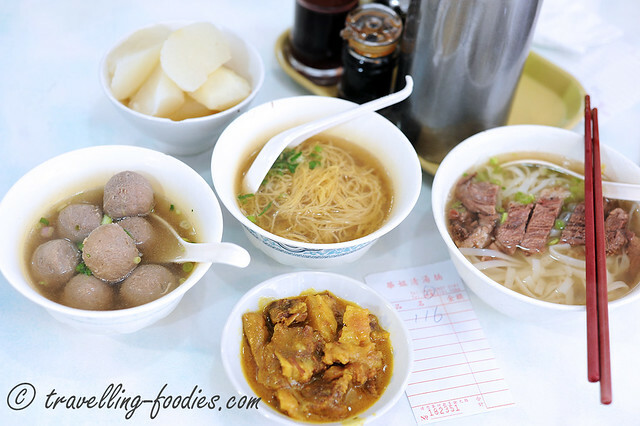 清湯牛腩河粉 Beef Brisket with Flat Rice Noodles in Clear Broth, 咖哩牛腩麵 Curry Beef Brisket Noodles and a bowl of 牛肉丸湯 Beef Ball Soup.And no, we did not forget a serving of white daikon radish which had been stewed in the clear broth together with the clear stock for a long time! 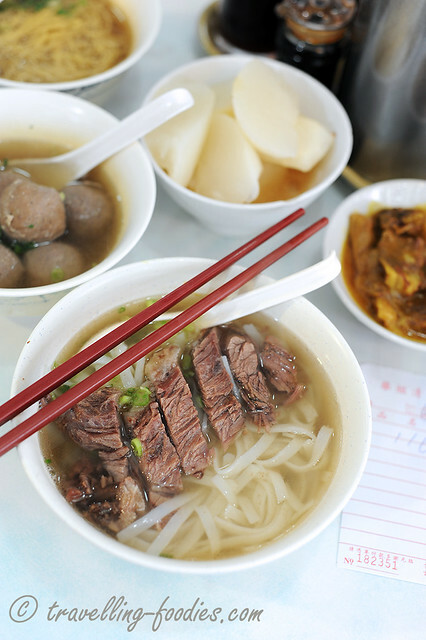 I went for their signature first, which are the beef brisket with flat rice noodles in clear broth. 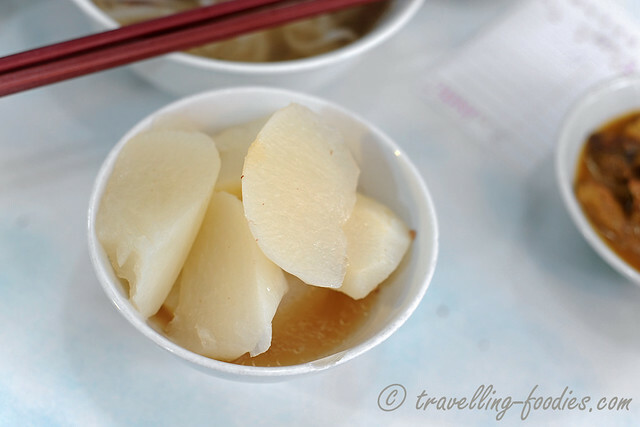 I’d always preferred flat rice noodles as opposite to the more famous egg noodles in Hong Kong. The latter has a strong aftertaste of ammonia incorporate in the noodle-making process which I find rather aversive. Moreoever, it would probably mar the delicate flavours of the clear broth. The noodles were precisely timed and cooked to perfection. They were soft and silky, slithering with ease off the chopsticks as one attempts to lift them up from that brothy spa, yet at the same time, retains much of that bouncy textures of good flat rice noodles together with the unmistakable aroma of rice from which it was made. Now this would not have been possible if the broth was too overpowering. That said, the broth is far from being bland, perpetuating the beautiful flavours from the beef brisket which it was stewed in. Like the noodles, the beef brisket was cooked to just the right texture, uber soft to the teeth and palate, yet retaining its basic structure as one could still make out the meat fibres within. The beef balls were also very good, purportedly one of the best J’s ever tasted. The meat was well seasoned but not in an overwhelming manner. They were delightful bouncy and chewy but not at all resilient to the teeth. Rumour has it that they are all hand made but given the amount Sister Wah has to expend on a daily basis, I remain doubtful to the claim. But one thing I am sure is they are delicious! The beef brisket curry was also quite tasty, with the flavours of the curry distinctively “Hong Kong” as I would brand it, as it is neither what one would expect in SEA or in India itself. Given the history of Indian expats in Hong Kong since the colonial days, HongKongers are well accustomed to the notion of “curry” as part of everyday Hong Kong cuisine. The meat are very tender though the only misgiving is that the cuts are a tad too fatty, seemingly trimmings from the larger chunks beef brisket which had been used to cook in clear broth. On the other hand, the small morsels of tendon hidden within were a pleasant surprise which I devour with much relish! 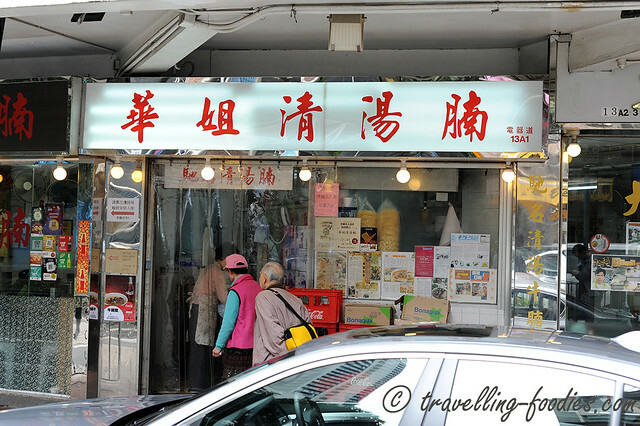 This entry was posted on April 26, 2014 by Alan (travellingfoodies). 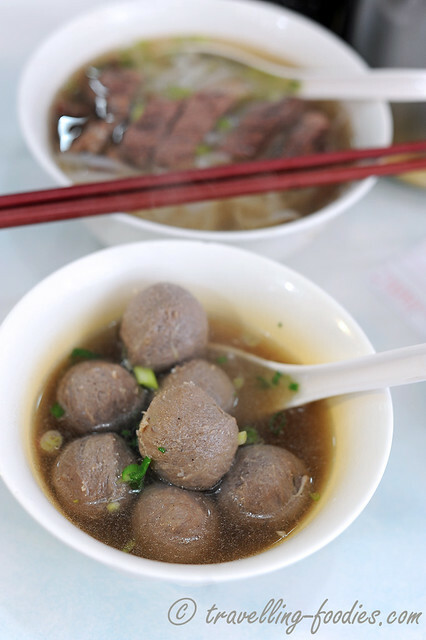 It was filed under Food, Travel and was tagged with beef brisket, causway bay, 牛腩, 腩汁萝卜, 華姐清湯腩, 面, Hong Kong, tin hau, white radish, 华姐清汤牛腩, 咖哩牛腩, 天后.